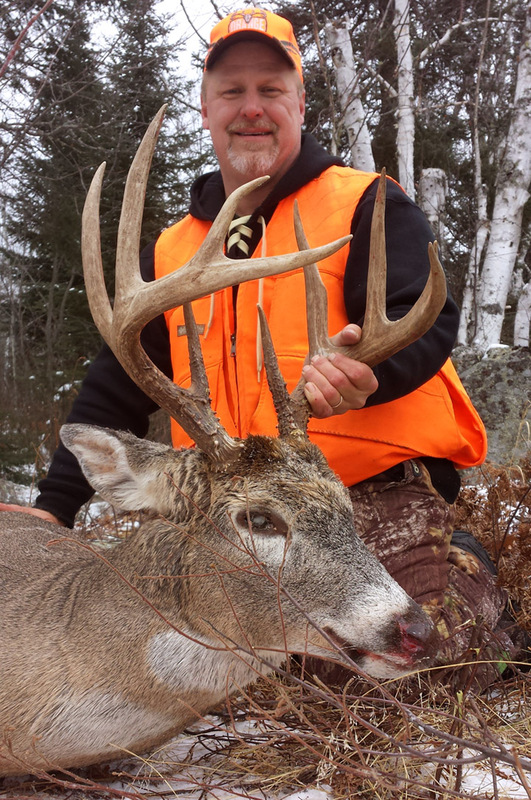 Doc's son David with his latest trophy buck. Though the region in which we hunt whitetails is not noted for record book bucks, though deer numbers there have never exceeded 11 per square-mile since 1990 (less than half of numbers found elsewhere in Minnesota) and though deer everywhere in this region are extremely wary because they are hunted year around by great numbers of wolves, my hunting partners and I have always managed to take our self-imposed limit of 3-5 mature bucks per hunting season (plenty of venison for us). Most years, at least one of the bucks we have taken weighed a bit over 300 pounds (live) and had antlers measuring 150 to 160 inches (Boone and Crockett measuring system). Most hunters would consider such a buck to be a buck-of-a-lifetime because few take more than one or two with antlers this size in a lifetime. This does not mean there are more 300-pound bucks in the area we hunt than in surrounding areas. It only means we are knowledgeable and skillful enough to more regularly take such bucks, a consequence of 45 years of scientifically studying habits and behavior of wild whitetails and continuously refining our hunting methods — all of which I have enjoyed sharing with other whitetail hunters nationwide via magazine articles, books and seminars since the 1970s.